The later concepts of “nature,” we said, must be held at a distance from this: phusis means the emergent self-upraising, the self-unfolding that abides in itself. In this sway, rest and movement are closed and opened up from an originary unity. This sway is the overwhelming coming-to-presence that has not yet been surmounted in thinking, and within which that which comes to presence essentially unfolds as beings. Terrence Malick is an American director whose films can be characterized as radical reevaluations of the current understandings of cinematic concepts such as image (and sound), character, and narrative. His films are intensely visual, abound in beautiful nature imagery and they elude explanation, in the sense of the reduction of a given phenomenon (say, a character’s behaviors) to various (psychological, sociological) causes, usually favoring expression of moods instead. To articulate the intentions behind such choices would be the task in hand in trying to make sense of his films. 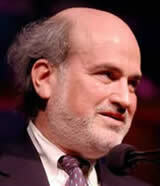 Malick studied philosophy and worked in journalism before he turned to film. He produced a translation of one of Heidegger’s short texts (1) and the philosopher’s writings appear to have influenced the films greatly. Malick also worked for publications such as Life, New Yorker and Newsweek. (2) His other influences seem to be the writings of philosophical figures such as Wittgenstein, (3) the works of realist, non-abstract modern painters such as Hopper and Wyeth, and silent films, embracing both the documentary tradition of Flaherty and the expressionist tradition of Murnau (by questioning, or ignoring, their “oppositional” status). 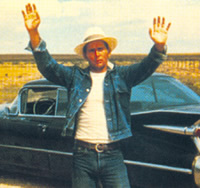 Malick’s first film Badlands (1973) is ostensibly a semi-factual account of a mass-murderer and his girlfriend, set in the 1950s. What’s immediately unusual about the film is its lack of interest in trying to explain the causes of its protagonists’ violent behaviors, and furthermore, its lack of moral judgment of these individuals or the culture that produced them. Instead the film’s focus is concentrated on their experience of alienation from the world that they inhabit and its values. As Heidegger might put it, the intelligibility of the world and the values people share are, at bottom, not based on justifications, nor are they arbitrary. It is a given fact, if you will, that they are based neither on unshakable foundations nor on arbitrary consensus. Malick’s lack of interest in the causes of the characters’ behaviors should not be understood as itself a moral judgment, as if their actions are in some nebulous way justified. This film is not a polemic, like Kiéslowski’s A Short Film about Killing (1988). Rather, Malick’s point seems to be that mere condemnation, or trying to determine the causes of their actions, essentially evades the fact that our world and values sometimes are unable to deal with certain human possibilities. The film could easily have been given a particular interpretive framework: it could have been a condemnation of American mass-culture or juvenile delinquents, or a polemic about the death-penalty and justice system. However because the film eschews any particular moral stance, it makes the viewer realize that attempts at trying to judge the characters as “inhuman” (or look for explanation for their actions) cover up the fact that our world and values are more fragile than we think they are. 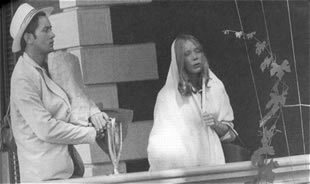 In fact, Kit (Martin Sheen) and Holly (Sissy Spacek) are barely aware of the monstrous nature of their acts, and they have no particular reasons for their actions either, except for the fact that they are running away from the lawmen. One of the film’s more indelible scenes involves Kit’s inability to explain to the policeman why he has done what he has done, after he’s just been captured (of his own accord, no less). He even finds people in general “Okay,” and is not a particularly hostile character throughout the film. 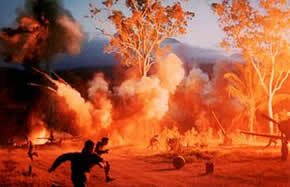 The film is also perceptive on the nature of a human being’s relationship to his or her world. Here, a phenomenon like alienation again is not given an explanatory angle: Kit and Holly’s loneliness and detachment from their world are not due to some particular psychological reasons or their places in a society. Rather, experiences such as alienation, anxiety, and listlessness are shown to be fundamental facets of human life, as life oscillates between the stable everyday world and its tasks and the realization that its stability is not based on unshakable foundations. Malick is insistent that human action is not always motivated by psychological causes. In effect, he challenges the traditional notion of the “character” as primarily defined by psychology, deeply buried within a person’s mind, instead preferring to envision human beings as by nature tied to (or being robbed of) their worlds, which forms the basis of any sort of human experiences. In fact, the freedom that Kit and Holly experience, as they retreat more and more from society, is an oppressive, unbearable one. James Monaco has described Malick’s films as “mythic” in appearance, but rather than imposing myths onto the reality, Malick finds mythic material out of the reality (or to use his own words, Malick “deduces” myths out of the reality, instead of “inducing” them). (4) It is a perceptive comment, for Malick’s films usually evoke (rather than explicitly “reference” or “replay”) various (cultural, literary, cinematic) myths. Malick himself believes Badlands calls to mind Tom Sawyer, Huckleberry Finn, and Swiss Family Robinson, (5) as they and his film look at our form of life, its values and rituals, from a distance. Days of Heaven (1978) is vaguely biblical both in tone and plot (the title itself, as Stanley Cavell has noted, has a biblical origin). (6) It evokes other films, without specifically commenting on them, and many believe it to be heavily influenced by Murnau’s City Girl (1930) and Sunrise (1927), and even George Stevens’ Giant (1956). Similarly, even though The Thin Red Line (1998) (7) actually quotes various religious and literary texts, such as The Bhagavad-Gita, (8) The Iliad (9) and The Grapes of Wrath, (10) as well as alluding to films such as Murnau’s Tabu (1931) and Cornell Wilde’s Beach Red (1967) (and From Here to Eternity, the James Jones novel, as well as Zinnemann’s film ), (11) one still wonders as to what such allusions are made for, since unlike most films that self-consciously refer to other films or myths, Malick’s films do not engage with them in a particularly critical manner, nor do they understand the notion of myth as something that obscures truth, or legitimizes ideological interests, etc. so that it needs to be “demystified” and “revised”, as in the films of someone like Altman or Godard. Instead, Malick understands myths as “cultural paradigms,” if you will, that function as a precondition for making sense out of the human experience, and that shape the sensibilities of the culture that produces them. Indeed, myths, as recognized as such, are not hypotheses that might or might not turn out to be true, as they serve a completely different function from the presentations of facts. The lack of much critical work on Malick’s films is partly due to the fact that (besides the lack of outputs) it is hard to articulate the motivations or concerns behind them. In the case of Days of Heaven, the difficulty is even more pronounced than the director’s previous film. Primarily a tragic love story, the characters and the plot are almost dwarfed by the overwhelming scale and the beauty of the film’s nature imagery. In a rather perplexing but nevertheless moving way, the film feels detached (in an almost religious sense, one might say) from the specific events within the film, never really delving deep into the particular emotions and minds of the characters. Pauline Kael, perhaps with impatience, likened the film to an “empty Christmas tree: you can hang all your dumb metaphors on it,” (12) which makes one wonder why she thought the film had to be metaphorical. The critics also have persistently noticed Malick’s sympathy towards the aesthetics of silent cinema. As stated, Days of Heaven is largely thought to be borne out of various biblical narratives, and also a self-conscious homage to certain silent films, which makes one curious as to why particularly silent films are being evoked. Is it a case of mere nostalgia? A more likely answer is that such evocations result from Malick’s understanding of notions such as image and narrative in relation to cinema. It is often asserted that cinematic images are “signs” (and the films “texts”) that are in need of deciphering, according to certain critical traditions and methodologies, that they are presented to us as something to be “understood” (or at least that understanding films, in various ways, requires theories). (13) Malick’s films are in some sense a profound challenge to such notions, as their primary concerns are not plots and characters with complex psychologies, nor some kind of intellectual engagement with ideas. Rather, Malick’s films are most distinguished for the primacy and beauty and poetry of their imagery, which reminds the viewers of the fact that the most primal and direct way in which cinema engages its audiences is via the power of images. (They also force the viewer to listen carefully as well to the sounds that the world produces, including the different poignant human voices). And the intention behind such relative lack of regard for the conventions of “narrative” cinema is not to be characterized as a subversion or aesthetic gamesmanship. Rather, the films are concerned with bringing cinema back to its humble origins, of presenting unmediated and uninterpreted reality, before its natures have split into different theoretical positions and approaches, such as the dichotomy between realism and expressionism, fiction and documentary, and the division of cinema into various genres and movements. Rather than merely paying homage to silent cinema, it appears to be a certain fundamental or primitive condition of cinema that he seeks, for most silent films are neither primitive, unmediated, nor uninterpreted presentations of reality. Still, Malick’s sympathy towards silent cinema may be thought of as some sort of yearning for purity in images, and may be borne out of a refusal to see cinema (and particularly cinematic images) as governed by various abstractions or opposing theses, instead understanding cinema as first and foremost a “physical” phenomenon that elicits awe and wonder before any impulse to understand and interpret it in terms of its meaning. In a sense, Malick’s films are both fiction and documentary, as they closely document the world that we live in and its inhabitants, akin to, as some have commented, National Geographic programs; as well as realistic and expressionistic. Indeed, contrary to some misconceptions about them, Malick’s films (and their images) are profoundly anti-abstract, anti-symbolic, and anti-modernist. Malick’s understanding of cinema seems to be influenced by Heidegger’s contention that it is a cardinal symptom of modernity (which he claims has its deepest roots in Greek thinking) to apprehend reality as something to be differentiated from how it appears to a subjective consciousness, and that the reality is understood at the most fundamental level as something to be mastered. (14) Surely, one of the guiding preoccupations of cinema, if one is to understand it as one of the chief products of modernity, is defining what a cinematic image ultimately is; is it a component of a narrative? A representation of the reality? Objective reality or subjective (psychological) reality? Psychological reality of the filmmaker or the characters? Is it a reflection of ideological values? Heidegger believes the early Greeks, who did not ground the nature of reality in constant presence (15), experienced the world not as a collection of substances (or what “appearances” really are) to be analyzed, but as a groundless source of mystery (and it is not insignificant, for the present context, that Heidegger thinks the world reveals itself to us via our moods, not cognition). Or as phusis, which has since degenerated into “nature” in the sense of the products or resources produced by nature. Phusis, in his words, means everything that “comes-into-presence,” or what unfolds itself in appearance, and the emerging-abiding sway, which, with its overwhelming power, has not yet been mastered by thought. (16) Malick, likewise, is wholly uninterested in envisioning his films as epistemological (or moral, or sociological, or what have you) inquiries for the audiences and the characters, instead preferring to envision them as a presentation of the world, in all its variety, as something to be faced with reverence. One might say, borrowing Wittgenstein’s phrase, Malick’s films are not interested in “how the world is,” or what happens to be true, but in “that it is,” the uncanny (and tragic and wondrous and humbling) fact of its very existence (which is to say, they are not trying to say something at all). (17) Days of Heaven, perhaps, cannot be described with more accuracy than by describing it as a certain embodiment of the site of human passions and tragedies, overseen by the gods and the cosmos where everything, human or nonhuman, has its place. Malick’s third, most recent and most uneven film, The Thin Red Line, is a further engagement with his concerns. If Badlands deals with the nature of our engagement with the world and Days of Heaven shows the world in a particularly primordial way (or a presentation of the reality as phusis, one might say), The Thin Red Line‘s inspiration (other than the primary source, the James Jones novel) seems to have come from, again, one of Heidegger’s claims, made in regard to Heraclitus’ fragment 53, that phusis shapes itself through polemos, (18) i.e. that reality shapes itself through conflict and struggle. Indeed, it becomes gradually clear that the film’s opening query, “what’s this war in the heart of nature?”, is not referring to a specific war, nor nature in a specific sense (such as “Darwinian” wars in the heart of nature, or the violent human “nature” at “war” with itself). As the film progresses, the terms’ senses become multiplied and relevant to natures and wars both cosmic and local, and of individuals, ideas, humans, and animals, and it is perhaps not overly interested in taking positions in the various “wars” that are being presented, nor in how their various “natures” are being understood. The film is interested in the fact that the world is governed by conflicts (between “opposites” – war and peace, darkness and light, etc. ), not in who’s on the “right” side of each of them. In fact, limiting the film’s identity to a war picture or an anti-war picture, or understanding the film’s point as various declarations (or arguments) about what “war” and “nature” are (and they would translate into utter banalities, or even redundant sentences, in any case, such as “war comes from violent human nature” and “war is a crime against Mother Nature”, and so on) would be confusing the film’s aims and the nature of the questions that are asked by the film’s characters. Like Wittgenstein, the soldiers in the film ask “where does (something) come from?” not as a demand for a causal explanation (and besides, as the philosopher puts it, explanations come to an end somewhere) (19) but as the expression of a certain craving that the explanation cannot satisfy. (20) If the film does make moral judgments of any kind they are not about justifying why there shouldn’t be wars and destruction of nature but are about a certain (modern) understanding of nature that allows humans to see the natural environment as a monolithic, meaningless abstraction, where destruction is allowed to happen with impunity and, as in Days of Heaven, the characters are less in control of nature than they think, as nature both nurtures them and violently rejects them in equal measure. As with Badlands and Days of Heaven, Malick’s concerns manifest themselves primarily in cinematic terms in The Thin Red Line. 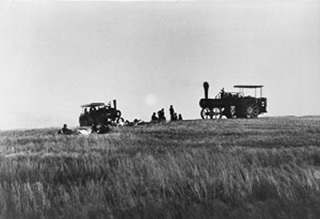 In the earlier films, particularly in Days of Heaven, the constant flow of images has very little spatial continuity, thereby making each image a discrete world existing on its own (or an emerging-abiding sway, one would say) rather than a small bit of perceptual information. A characteristic surge of images is the sequence that begins with the departure of Bill (Richard Gere) with the circus performers and ends with the time-lapse image of sprouting seed; there is no dialogue, save for the offscreen narration, no narrative content, and no continuity, but only the overwhelming power of the images which have not degenerated into “signs” or “symbols”. The Thin Red Line is comparatively more complex in its structure. It is structured in terms of various oppositional elements (or “wars” or polemos). These include oppositions such as those between “individual” and “collectivity” (or the self and the other), as exemplified by the film’s extremely odd use of voiceover narrations. The voiceovers are read by different characters, but not necessarily the ones that are on screen while the lines are uttered. Furthermore, the flashbacks and the “subjective, mental” images are insufficiently distinguished from the “objective, corporeal” images. When we first see Tall (Nick Nolte), it isn’t clear whether what follows (the conversation with the general [John Travolta]) is the event recalled specifically from his point of view, or something that follows in chronological order. The shot of Witt (Jim Caviezel) looking around at his comrades is followed by a shot of Bell (Ben Chaplin) thinking by himself, and a shot of praying hands, before the scene continues back to Witt. And perhaps most tantalizingly, during Bell’s musings, a shot of his wife (Miranda Otto) standing by herself is disrupted by a figure that enters the frame from afar, vaguely recognizable as a man in military uniform; is he Bell as he imagines himself, or some projection of his fear (of her infidelity), or is the scene about what actually happens to her (that she falls in love with another soldier)? Ultimately, however, the film’s primary weakness is that its verbosity (and overly self-conscious poetic effects) seems a less convincing sign of the director’s commitments to the characters (not as characters, but as human beings) than the piercingly simple dialogues and voiceover narrations used in the previous two films. It appears as if Malick was torn between presenting a convincing drama (which Badlands and Days of Heaven are), and a philosophical inquiry unencumbered by the various demands upon it (as a war film, as a drama, as a popular film). As it is, it is not really convincing either as a drama, of men in war, or as a philosophical inquiry influenced by Heidegger and Wittgenstein. Yet the film that we do have is still a fascinating combination of different impulses and motivations. Malick’s unique cinematic style has produced many admirers, but not many acknowledged disciples. One recent exception is a young director called David Gordon Green, who admitted Malick’s influence in his film George Washington (2001). Since The Thin Red Line, it looks like the director has entered another period of inactivity (there were twenty years separating it and Days of Heaven), at least in terms of directing. It is hard to say what further course Malick’s career will take, but undeniably, the three films he has made so far are sources of much beauty and provocation. Several articles can be found here. Dedicated fan site on Malick. In the introduction to The Essence of Reasons, Malick finds Heidegger’s notion of “world” similar to Wittgenstein’s “form of life”. Adapted from the novel by James Jones. In an instructive paper, Jimmie E. Cain, Jr. corrects the received opinion that the film has little to do with the novel. In fact, the aspects of the film that are thought to be irrelevant to the novel (such as nature-worshipping, equating modern warfare with modern technology, allusions to “nirvana,” etc) come from either the novel itself, or Jones’ other writings and personal beliefs (based on his readings of writers like Emerson and various religious texts). Cain believes Malick is intimate with Jones’ works as a whole. The film incorporates Jones’ From Here to Eternity heavily, perhaps in awareness of Jones’ claim that the main characters of The Thin Red Line are “spiritual continuations” of those in From Here to Eternity, and the film explores the relationship between the two works. It is reasonable to say that what drew Malick to Jones’ novel in the first place is the affinity he detected in Jones’ concerns with his own, rather than a desire to transpose his own concerns onto the novel. 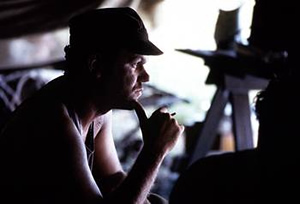 See Jimmie E. Cain, Jr., “’Writing in His Musical Key’: Terrence Malick’s Vision of The Thin Red Line”, Film Criticism, Fall 2000. For a study of Jones’ spiritual beliefs, see Steven R. Carter, James Jones: An American Literary Orientalist Master, Urbana, University of Illinois Press, 1999. For example, “rosy-fingered dawn,” the human corpse eating by dogs and birds, “Those birds up there, they eat you raw,” an allusion to 16:976 (trans. Fagles), etc. come from The Iliad. “Maybe all men got one big soul everybody’s a part of” comes from Steinbeck’s book. Pauline Kael, 5001 Nights at the Movies, New York, Henry Holt, 1991; She writes (quite aptly) “What is unspoken in this picture weighs heavily on us, but we’re not quite sure what it is,” and then seems to conclude that “what is unspoken” has to be reduced to something else, namely, the metaphors. Still, she writes extremely perceptive things about the film, such as the “unrelated” and “pieced-together” quality of the “overpowering” images. As opposed to what emerges in absence, and what conceals in presence. Interestingly, Cavell says things on film are present in their absence-or absent in their presence; Cavell, The World Viewed, Cambridge, Mass., Harvard University Press, 1979, pp. xiv-xvi. As if cinema is concerned with “presence of what is present”, not what is present, and that is not a theoretical statement, it is what is ordinarily meant by “things on film”. They are there by not being there, and they are not there by being there!